HUFFMAN – Taking full advantage of three four turnovers, including three interceptions the Hargrave Falcons shut out the Tarkington Longhorns 20-0. The win improves their record to 5-3, 4-2 in district play and assures them a playoff spot as the second place team in district. After a scoreless first quarter, the Falcons got on the score board in the second quarter when Cole DeBerry completed a 43-yard touchdown pass to Casey Martin. DeBerry was 7 of 14 in the game for 123 yards. Martin had three catches for 68 yards. On the Longhorns next possession Jake Abshier picked off a T. Hobbs pass and returned it 28 yards for a touchdown. The Falcons attempt at a two-point conversion came up short, leaving them with a 13-0 halftime lead. The score stayed at 13-0 until the final quarter when Tyler Orn excited the visiting Falcon Faithful. Taking the handoff on his own 17-yard line, he broke through a line of tackles and went the length of the field for a 83-yard touchdown run. On Friday night, the Falcons will play Silsbee (5-4) on the Class 3A, Division 1, Region III Bi-District championship. The game will be played at Sam Houston State University in Huntsville beginning at 7:30 p.m. The winner will move on to play the winner of the Jasper- Tyler Chapel Hill game which will be on Saturday. CROSBY – Playing for second place in the district standings, the Crosby Cougars ran into a tough C.E. King Panthers team and was unable to pull out an upset, losing 39-24. The loss was only the second one for Crosby in district, with the other coming to Dayton, which beat every other team in district as well. The Cougars found themselves behind early in the game and was unable to make up the lost ground. In the first quarter, King scored first on Terrence Guys 13-yard run. Four minutes later Crosby tied the game when Dominic Merka scored from the 7-yard line. In the final seconds of the first quarter the Panthers kicked a 33-yard field goal to go up 10-7. Crosbys offense stalled in the second quarter, as they were unable to put up any points. The Panthers took advantage of this to score two more touchdowns to give themselves a 23-7 halftime lead. The Cougars got back one the scores in the third quarter when Forrest Tyler scored from the one-yard line. The Panthers responded quickly with Jimmie White scoring on a 49-yard run. Another field goal in the fourth quarter by King made it a 29-14 game. Sam Fowler added his own field goal for Crosby in the fourth quarter, hitting from 32 yards out. Merka gave Crosby their final score of the game with an eight-yard pass to Paul Erwin. Merka was 24 of 37 for 243 yards with one interception. He also rushed for 42 yards on eight carries. Tyler led the Cougars in receptions with five catches for 74 yards. The primary difference between the two teams was the running attack. The Panthers had 462 yards rushing, with A. Alexander accounting for 136 of those yards, Z. Jones with 93 yards and Josh Williams with 92 yards. The Cougars will now turn their attention to the Lumberton Raiders in Bi-District play. The teams will meet Friday at Turner Stadium in Humble at 7:30 p.m. 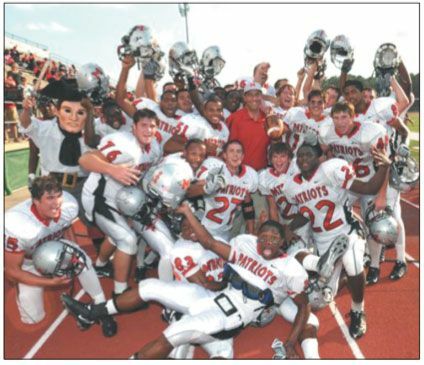 The Goose Creek Memorial football team presents the game ball to GCM Principal Al Richard (who is in the center of the picture) following the teams first win. They beat Kingwood Park 34-10. 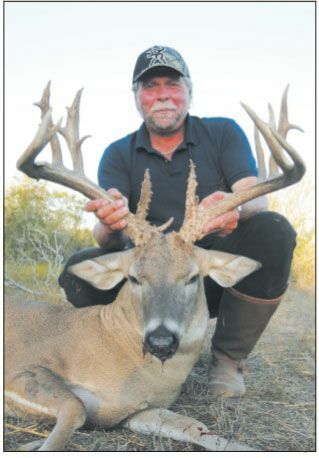 Keith Coble, owner of Highlands Tractor & Kawasaki and Humble Kawasaki, harvested this 199 point B.C., 278 lbs. deer with 23 points on November 9 at S.L.C. Land & Cattle Co. of Highlands. The ranch, named 888 Ranch, in Live Oak County has lots of big, trophy quality, white tail deer and a few hunts still available. Reference 888ranch.com for more details. At about 2:20 p.m. Saturday, the Tex-Trude plastics warehouse on Sheldon Rd. erupted into flames, the blaze would be battled for 16 hours before Crosby Volunteer Fire Dept.s Tower Truck #82 sprayed directly into the flames, containing the fire. According to the owner of the warehouse, the fire started inside the reaction” department where plastic products are converted for sale. Channelviews fire department indicates that each of the three warehouses at that location is full of plastic pellets in cardboard and metal totes. As of 6:00 p.m. last Nov. 8, 150 firefighters from 12 fire departments fought the flames. The main water source for firefighters is a 10-inch main on Sheldon Road. Fire trucks shuttled in water because the supply was greatly exceeded by the demand. On Sunday, Crosby VFD closed out the burning issue with their largest truck. According to Cloverleaf Fire Department Chief Michael Battise, Harris County Pollution Control was testing the air. He said that even though the smoke was heavy, it is not considered toxic and no shelter-in-place or evacuation orders have been issued. 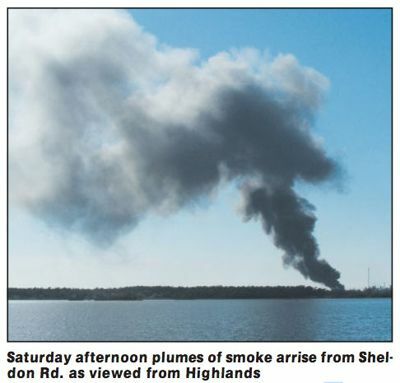 Plastic when burned generally gives off toxic smoke, according to the Environmental Protection Agencys Website. Twenty Tex-Trude employees at work when the fire started have been found and all are uninjured by the fire. 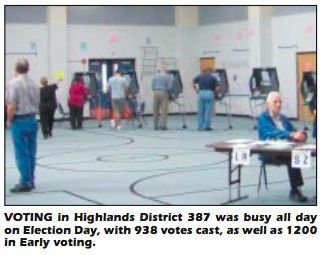 EAST HARRIS COUNTY  Voters in East Harris County expressed contentment for the jobs that local elected officials have been doing, returning two incumbents to their posts. State Representative Joe Crabb beat another Joe- Joe Montemayor with 65% of the vote to win the District 127 seat. Justo Perez came in a distant third with 2% votes. Ken Jones, who has served as constable for Harris County Precinct 3, will keep his badge as voters overwhelming supported him in his reelection bid. He beat challenger Tony Lewis 67% to 32%. Voters in the Crosby ISD service area returned two incumbents to the board In Position 4 Sheryl Shaw defeated Kathie S. Slotter 63%-36%. Dan Kasprzak, who holds the Position 6 seat, edged out Will Locke 50.4% to 49.5% or a difference of 49 votes. Gerald Blankenship ran unopposed for the seat that was held by Earl Boykin. Winners in the Huffman ISD Board Election were Charles Bardwell, Dean Tinnin, Denise Shirley and Guy Smith. Ed Emmett, who took over as county judge when Robert Eckels resigned the post, beat Democrat David Mincberg with 53% of the votes. Republican Pat Lykos will be the first woman to serve as Harris County District Attorney. She beat out Democrat C.O. Bradford 50.2 to 49.7%, less than 5,000 votes. Mike Stafford was a victim of the Democratic straight ticket voter, losing 51-48% to Vince Ryan. Democrat Adrian Garcias attempt to unseat Sheriff Tommy Thomas was successful, as he got 56% of the vote. In the race for Harris County Tax Assessor/ Collector Paul Bettancourt defeated Democrat Diane Trautman 51% to 46%. The Goose Creek CISD held a presidential election prior to Tuesdays national election. Goose Creek students selected Barack Obama as the next president. The nations voters concurred, sending him and running mate Joe Biden to Washington D.C. with 333 electoral votes to Republican nominees John McCain and Sarah Palins 155 votes. In other national races, Senator John Cornyn lost to Democratic challenger Rick Noriega, who recorded 50.7% of the votes. Congressman Gene Green will get two more years in Washington after beating Republican Eric Story and Libertarian Joel Grace. The race for Congressional District 2 was a landslide with Republican Ted Poe outpacing Libertarian Craig Wolfe 89% to 11%. Texas Secretary of State Hope Andrade estimated that 68% of registered voters cast ballots, either during early voting or on Election Day. This is the second highest percentage in Texas history, with the highest coming at 73% in 2004. CROSBY  There was a time in which Veterans Day held a pale shadow to Memorial Day but ongoing world dangers have heightened local senses of gratitude for those who serve their country in the military. 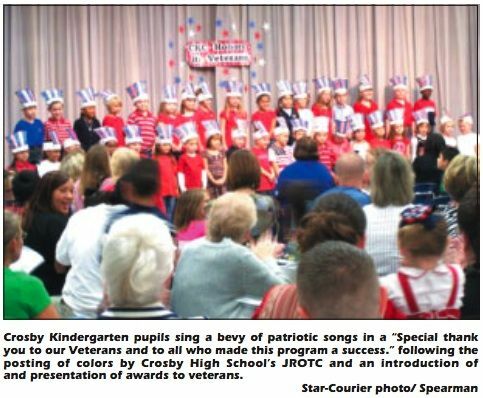 Crosby ISD schools, the local Harris County Precinct 4 Community Center and a Veterans Luncheon at the American Legion Hall are holding a series of Veterans Day Celebrations featuring the color guard of Crosby High Schools JROTC. Beginning at Barrett Primary at 9 a.m. on Nov. 3 and at Crosby Kindergarten last Monday at 7p.m. by the classes of Mrs. Brown, Mrs. Hall and Mrs. Rucka, the ceremonies last through Nov. 11. On Thursday, Nov. 6, Crosby Middle School has a ceremony at 8:30 a.m. and Crosby High School will hold a ceremony on that same day at 1:44 p.m. Drew Intermediate School will hold a ceremony on Friday at 1 p.m.
Crosby American Legion Post #658 at 14890 F.M. 2100 hosts the Veterans Luncheon on Nov. 8 from 11:30 a.m. until 1:30 p.m.
A Veterans Ceremony will be held at the Crosby ISD Annex on Sunday, Nov. 9 at 10:30 a.m.
On Nov. 11, Veterans Day, Newport Elementary will hold two ceremonies, one at 9 a.m. and another at 2 p.m. The Crosby Community Center will host a Veterans Day Ceremony at 11:30 a.m.
Veterans Day is a remembrance of the service of individuals of all American military branches. The day was commemorated in 1918 as Armistice Day, the conclusion of World War One, the war to end all wars. Major hostilities of World War I were formally ended at the 11th hour of the 11th day of the 11th month of 1918 with the German signing of the Armistice. Both a federal and a state holiday in all states, it is usually observed on Nov. 11. However, if it occurs on a Sunday then the following Monday is designated for holiday leave, and if it occurs Saturday then either Saturday or Friday may be so designated. It is also celebrated as Remembrance Day in other parts of the world, falling on Nov. 11. 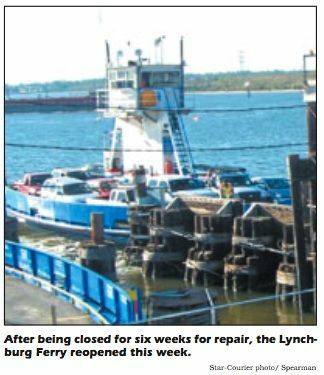 LYNCHBURG – The Lynchburg Ferry, closed since Sept. 12 due to Hurricane Ike, reopened at noon on Nov. 3. Special cranes were floated up the channel to lift the ferries from off the pilings, which make up part of the landings. Thorough inspections have been conducted and all necessary repairs have been made to the boats. The total cost of repairs and inspections is about $300,000. 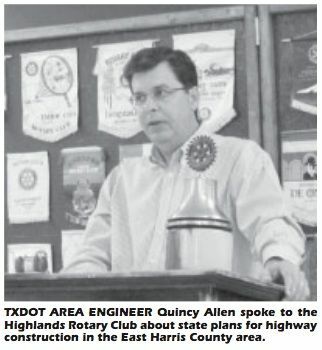 The ferry serves about 1,500 vehicles per day operating between 4:30 a.m. and 8:15 p.m.
HIGHLANDS  Drivers might as well get used to the inconveniences of the I-10 construction, said TxDOT Engineer Quincy Allen, as he spoke to the Rotary Club in Highlands, because in spite of the fact that the project is on a fast track, it will take six months to rebuild the Eastbound lanes, and another six months after that to rework the Westbound lanes. Allen, a sixth generation Texan, recalls as a boy seeing the I-10 highway constructed, over 50 years ago. It is because of its age, plus the wear from heavy traffic, that required the rebuilding of the roadway. Allen said that later in the month, with state approval, the speed limit will be reduced through the work area, to 50 MPH. In other areas, the state will finish the US90 connection to I-610, near the Budweiser plant, in the year 2010. At that time, a clear two-lane highway with frontage roads will extend to Crosby and beyond. Another TxDOT project recently completed is the three large bumpers built in the San Jacinto river below the I-10 bridge. These are to keep barges and boats away from the bridge structure during high water flooding. Another project Allen says will commence soon is the widening of frontage roads in the I-10/Mercury Drive area. Crosby projects, including the railroad overpass and a new Westbound exit ramp from US90 to FM2100, are on hold, awaiting new funding when the state legislature meets in January 2009. Nay, Im more on the angry side! The subject of my wrath is the lead article in the October 16, Star-Courier telling of the once again delay of the Crosby railroad overpass on Rt. 2100. I just couldnt believe it when I read that article. Writer Lewis Spearman said it was the third time the project had been delayed and I reacted to that. I thought it had been delayed more often. However, after discussions with Lewis and others I guess it just seemed to me the delays were more frequent. My first ever trip to Crosby was in May of 2001 when the trip was made to assist in my sons move from inside the 610 Loop in Houston to Newport. A move I have seen as a fine one from the first time I laid eyes on Crosby, Newport and the rest of the area. I think, and have said previously, I believe you live in a desirable section of Texas and the U.S. Rumors, and perhaps some facts were floating around the area then about straightening out portions of Rt. 2100 and the much-needed overpass. Ive been in the area for at least three months each year since then and believe that overpass should be high on the list of area needs.. When the last delay occurred and the announcement was made that some work would begin in early 2009 I said to myself, it is about time. I was pleased. Now, since no date has been given for its construction date, I wonder if it is all a figment of my imagination. At least, when it was delayed earlier, dates were set when construction would begin. It appears to me Crosby, and environs, is not exactly high on the needs lists for the Texas Department of Transportation. I am also disturbed in the way this delay was announced… It appears the decision was made earlier but kept undercover for some period of time. It also appears consideration of the Union Pacific Railroad, owners of the local tracks, was at least a partial cause for this delay. Another track may be needed, and that is all well and good, but cant ways be worked out to allow for that and still build the overpass? I wonder if the Union Pacific holds a bigger stick than the people of Crosby? The overpass needs to happen in my view.